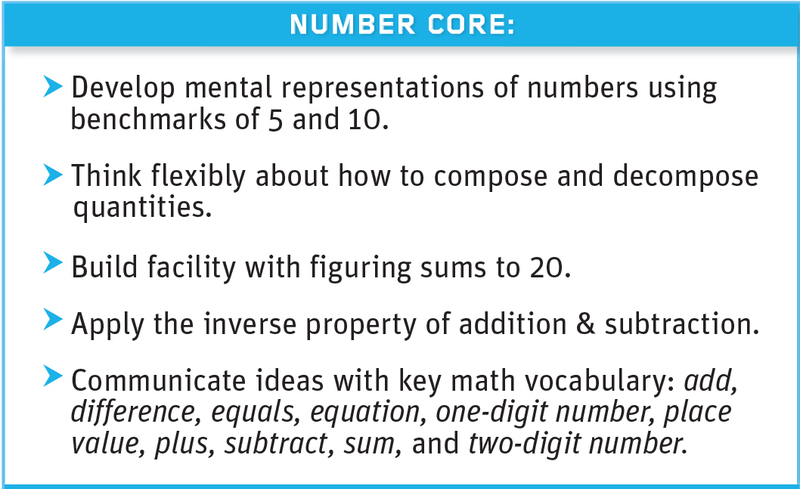 Number Core supports students’ success by building the foundations of Numbers and Operations. Students develop mental representations of quantity using the benchmark number of 5 and then 10, learn to think flexibly about how to compose and decompose numbers, and build facility with figuring sums to 20. 1) 10 is an organizer for our numeration system. 2) Numbers can be composed and decomposed. 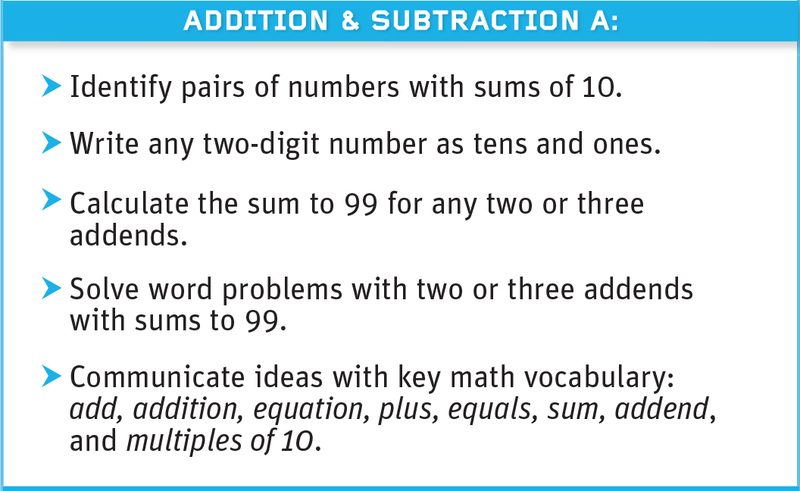 These two big ideas help students make sense of meaning behind the addition facts and calculations involving regrouping. 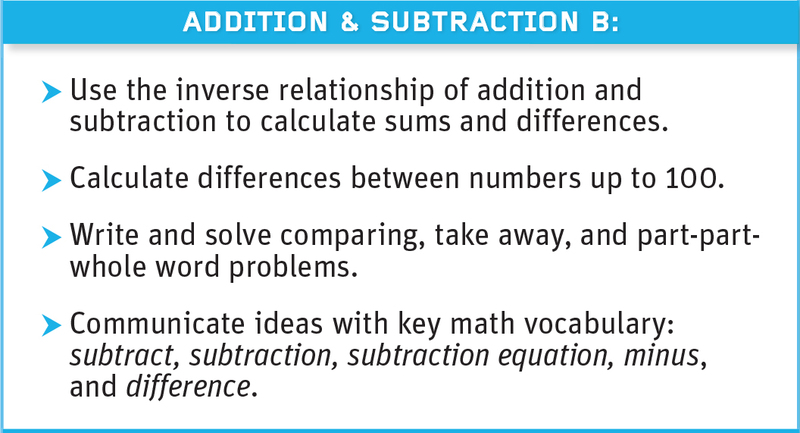 Addition & Subtraction B reinforces subtraction and addition as inverse operations. The major emphasis of this module is on helping students recognize the three meanings of subtraction in real-world contexts: take away, missing part, and comparison. 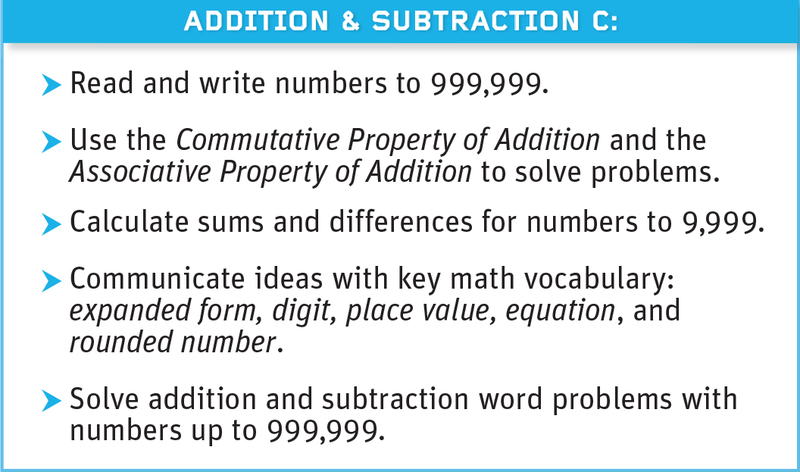 Addition & Subtraction C applies the big ideas to calculations with larger numbers. Students use the splitting strategy and open number line to solve various word problems with addition and subtraction involving numbers up to 999,999. Applying the Big Ideas of Base-Ten to Multiplication. 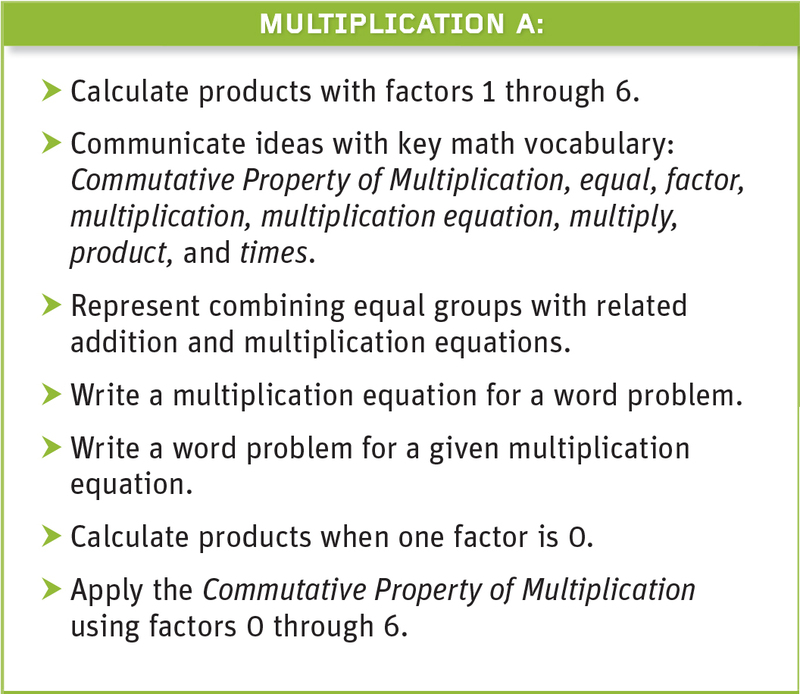 Multiplication A provides visual and contextual models for helping students understand the meaning of multiplication—a major stumbling block for students that requires a shift from thinking additively to thinking multiplicatively. Multiplication B uses an array model to represent the basic facts and show how the Commutative Property reduces the number of facts to learn. 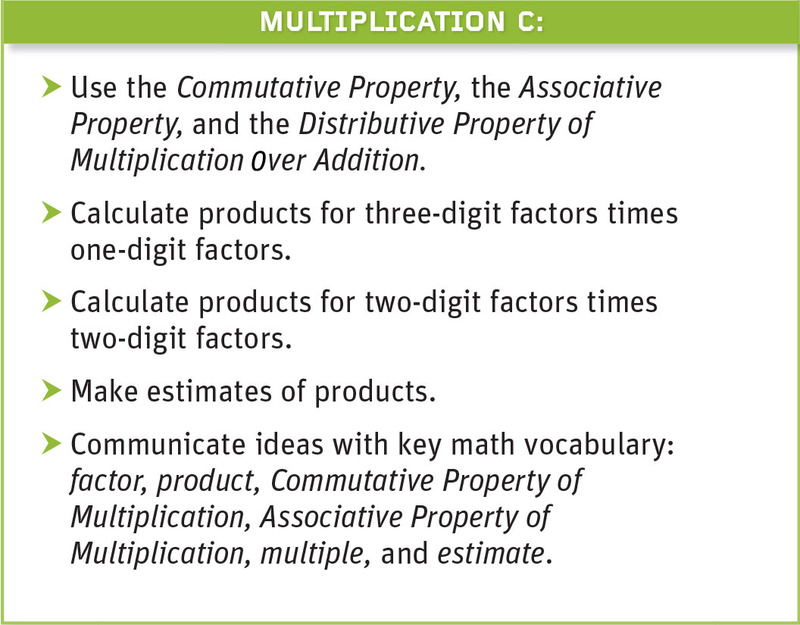 Applying the big idea that numbers can be decomposed to splitting array models lays the foundation for the Distributive Property and provides students with strategies for multiplying. 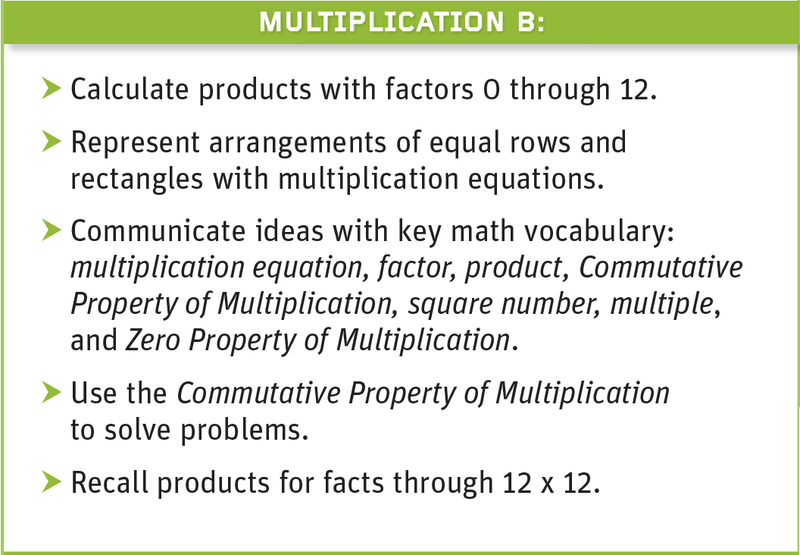 Multiplication C combines composition and decomposition of factors with understanding the patterns for multiplying by 10 and multiples of 10 to make sense of multidigit multiplication. Applying the Structure of the Base-Ten System to Division. 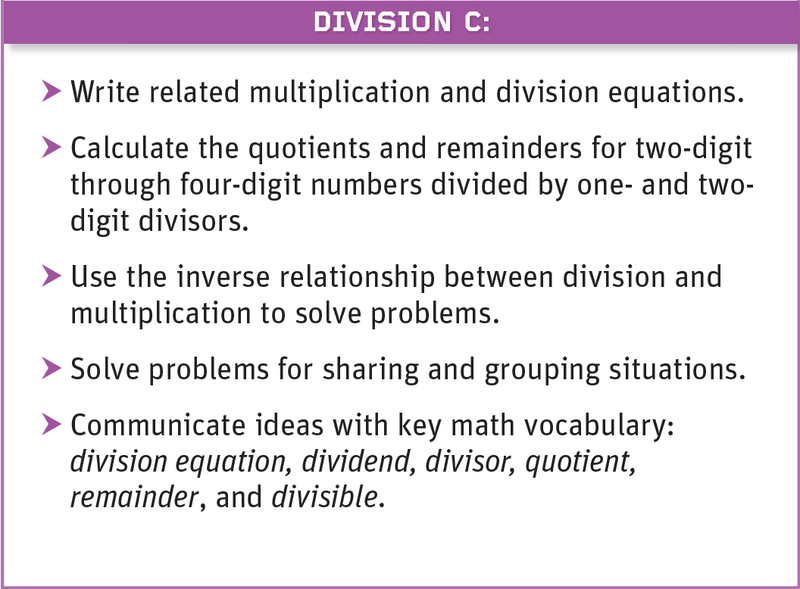 Division A builds on the idea that division is the inverse operation of multiplication, eliminating the need to memorize division facts as a separate task. 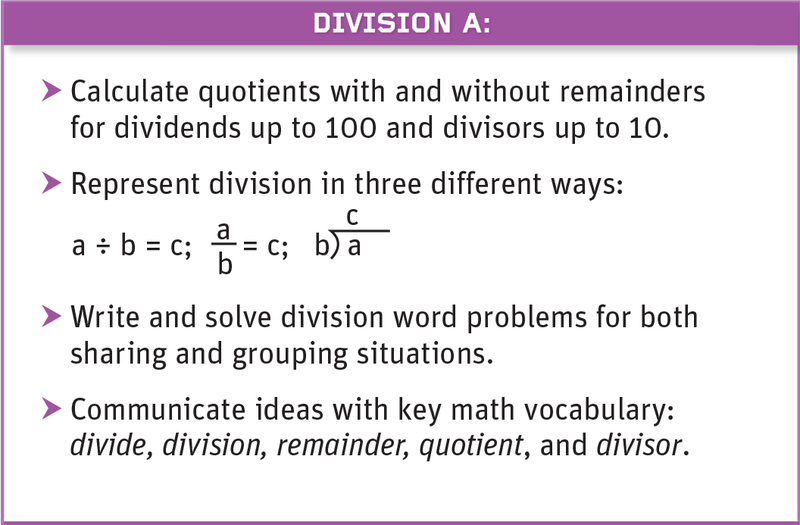 Computational methods for solving a division problem are introduced contextually and concretely to help students understand the two meanings of division—sharing and grouping. Division B applies and builds on the inverse relationship between multiplication and division to make sense of divisibility. The procedure for recording division involves thinking inversely about taking out a quantity by groups of 10 and/or a basic fact. 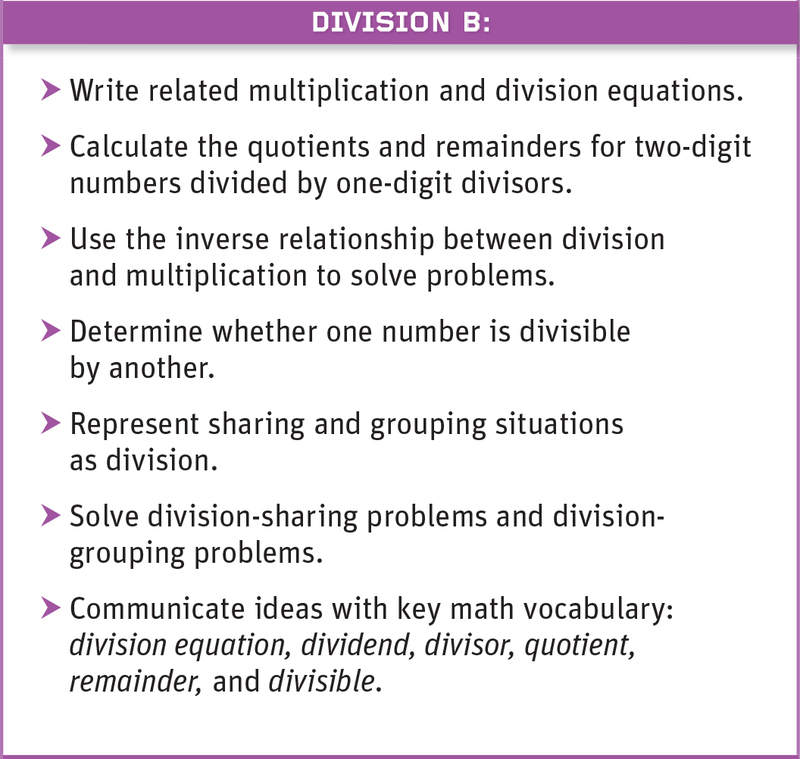 Division C extends the meaning of division and the big idea of decomposition to make sense of learning to calculate and record more complex long division problems. Students think about decomposing the dividend to take out 10, 100, multiples of 10, multiples of 100, and basic facts. Building the Structures of Fractions. 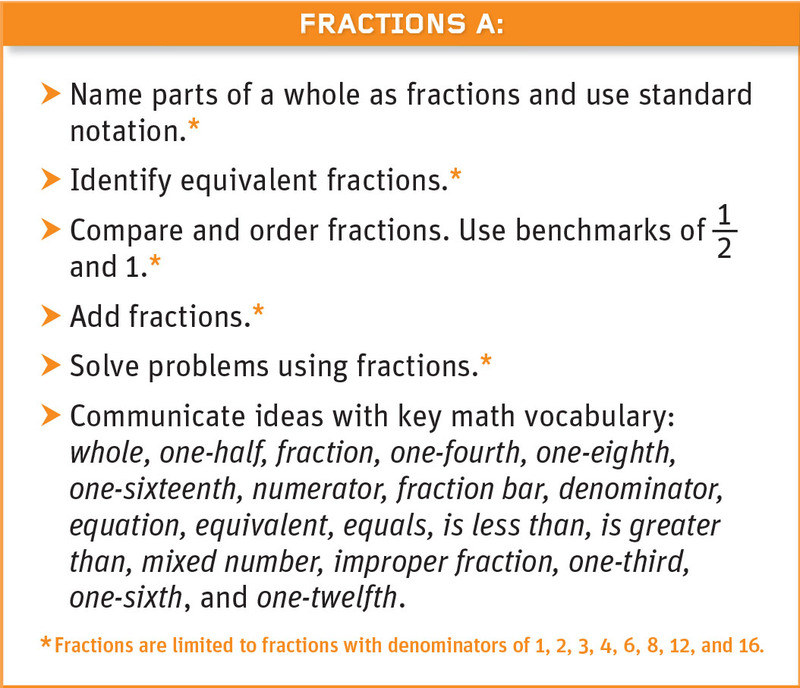 Fractions A connects to and builds on the big ideas of whole numbers as they apply to fractions. Teaching with concrete materials like fraction strips is essential for helping students give meaning to the abstract ideas of fractions. 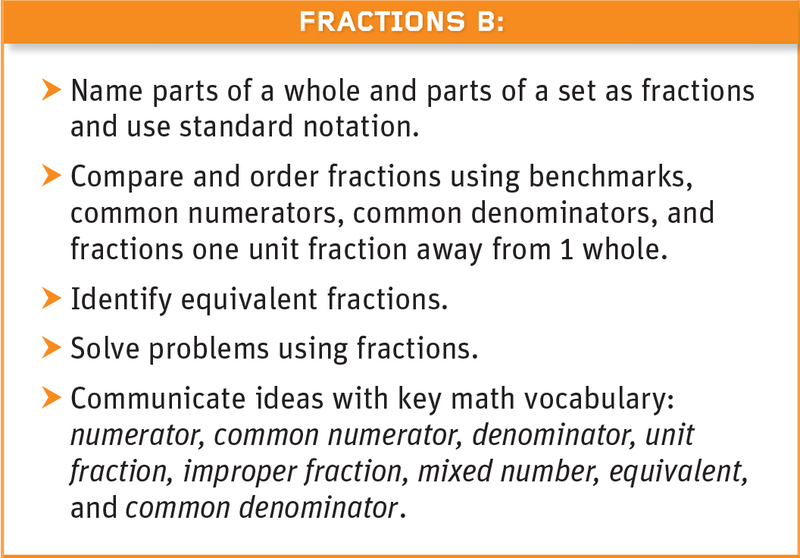 Fractions B extends learning on the basic equivalences for fractions by developing strategies for comparing and ordering fractions. 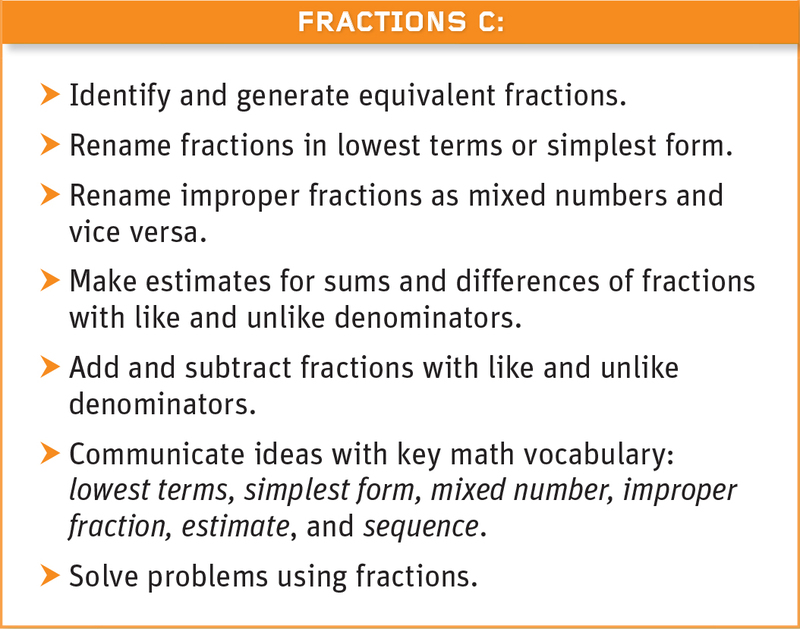 In contrast to teaching only one strategy for comparing fractions—converting to common denominators—students work from a toolkit of six strategies that keeps the instructional focus on the meanings of the fractions being compared. Fractions C builds on what students have learned in Fractions A and B and uses the big ideas to compute with fractions. Students develop the computational tools and strategies to add and subtract fractions, including improper fractions and mixed numbers with like and unlike denominators.